Green smoothies, or smoothies made with part fruit and part green vegetables, have some significant health effects associated with them. Consuming four cups of green smoothie a day has been reported to improve digestion and even eliminate cravings for junk food. Smoothies can be prepared a few days in advance and stored in the refrigerator until you are ready to drink them. Vegetables are packed full of vitamins, minerals and omega 3's, making them nutrient-dense foods. Green, leafy vegetables such as spinach, kale and lettuce are especially nutrient dense, making them good components of a green smoothie. By pureeing, or juicing, the vegetables in the blender, nutrients are released from within their encapsulated cellulose walls and are easily absorbed into the bloodstream. 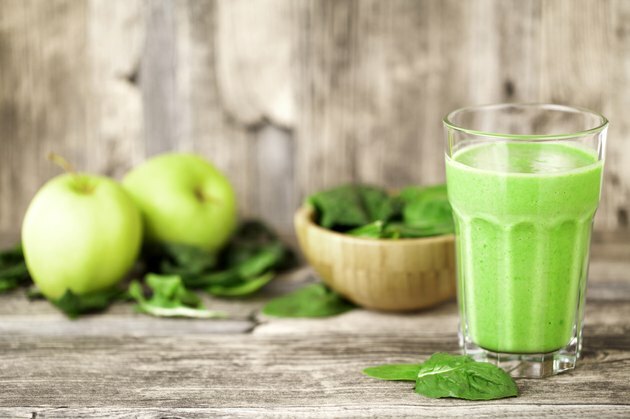 A related benefit is that consuming a green smoothie not only provides the body with a good supply of nutrients, it also helps to curb junk-food cravings. Green smoothies provide nutrients that promote healthy digestion. Consuming enough fiber, which can be found in many leafy green vegetables, as well as drinking plenty of fluids helps to promote healthy bowel habits. In addition, individuals who regularly drink green smoothies typically consume fewer foods that are high in sugar and fat, helping to promote good digestion. In the same manner that green smoothies promote nutrient absorption, they provide increased energy. The more nutrients that enter the bloodstream, the more energy the body is able to use. The folate and vitamin E in these veggies all contribute to improving skin complexion thus keeping skin in good shape, and the vitamin K and calcium protects against osteoporosis, an age-related bone loss condition. Additionally, these and other nutrients contained in green leafy vegetables can help to improve the health of the immune system and internal organs. According to the U.S. Department of Agriculture, dark green vegetables may be one of the top cancer-preventing foods due to their high antioxidant content. Green smoothies are made with half green leafy vegetables and half fruit along with a liquid component. Green vegetables can include spinach, kale, lettuce, celery or wheatgrass. Fruits can be fresh or frozen and can include banana, strawberries, pear, blueberries and pear. The liquid component of the green smoothie can include any type of milk, water, yogurt or orange juice. Once you have decided what to use in your green smoothie, blend the greens and liquid together first for 15 to 20 seconds. Add in the fruit of your choice and blend for around 30 seconds until smooth. You should use equal parts of greens, fruits and liquid when making a green smoothie. Is Drinking a Smoothie Like Eating Solids?